The flowers in bloom outside are tricking my mind into thinking the weather has turned warmer. As a result, I feel like I might be getting sick again since I’ve failed to bring a warm jacket on many occasions lately. My muscles are also aching like crazy from some heavy lifting work for our house construction and all I feel like having right now to recuperate is to drink some hot soup and lie in bed. So I’m glad that I actually made tonjiru (Japanese pork miso soup) the other day and have enough leftovers to not have to make a new batch. 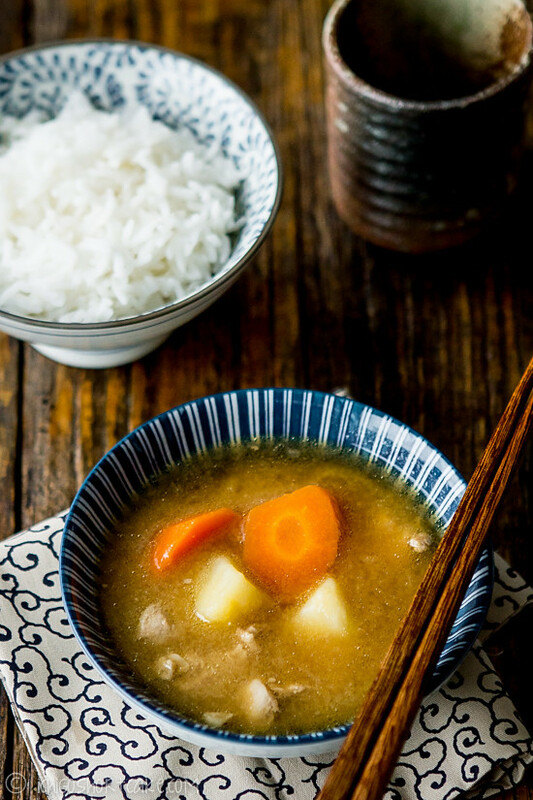 Tonjiru is by far one of my favourite soups that is so full of flavour but is still quite easy to make and is perfect for taking away winter blues or as a hearty soup to warm the soul. I’ve seen quite a few different ways to make this and my favourite is Nami’s fabulous recipe. However, I have made my own version as this is how I’ve always liked and made it. I call it the ‘Jenny’s tonjiru reinvented’ as it’s quite different to the traditional tonjiru in that it uses soy sauce and mirin (Japanese sweet rice wine). 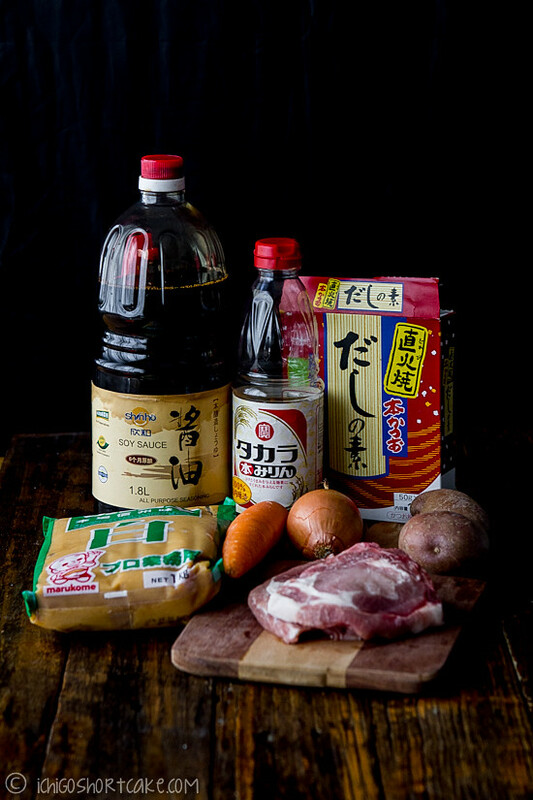 If you’re looking for the classic variety and want to try a recipe by a Japanese native, hop over to Nami’s blog for this and many more great Japanese recipes. It’s probably not a surprise that pork and carrots go well with a slightly sweet soup base as I think they are naturally well paired flavours, so this soup was great with that added mirin which gave it that extra sweet kick. If you don’t like it to be slightly sweet (or don’t have mirin and soy sauce) feel free to omit these and make just the classic miso soup base. 1. Pour cooking oil into a medium pot on medium high heat, fry pork and onions until meat is browned on both sides and garlic and onions are fragrant but not browned. Take care to constantly stir them so they don’t stick to the bottom. Some stuck bits are ok as they will be deglazed later. 2. Pour in prepared dashi stock, soy sauce and mirin and bring to a boil. 3. Add in potatoes and carrots and cook for roughly 10-15 minutes, until potatoes and carrots are soft enough to eat. 4. Just before serving, dissolve miso in a small bowl with 2 tbsp of warm water and stir through the pot. Alternatively, you can add in miso paste using a sifter. This is to ensure there are no chunks of undissolved miso in the soup. Taste the soup as you add miso as it can be quite salty. Add more water or more miso based on how salty you like it. 5. Serve hot with a bowl of rice. Question time: What’s your favourite soup? Do you serve your soups with grains or breads or do you like to drink it by itself? A beautiful soup! Really comforting and surely delicious. Boy, I get you about everything aching sometimes! Love the depth of this soup! Yum! I need to make this with some silken tofu thrown in. looks soooo delicious and full of flavor! Great looking soup. I hate it when I get sick, and soup always perks me up. I like soups made of dried beans and pulses a lot – so much flavor. Although this looks wonderful. Thanks for this. Sounds like comfort soup to me! 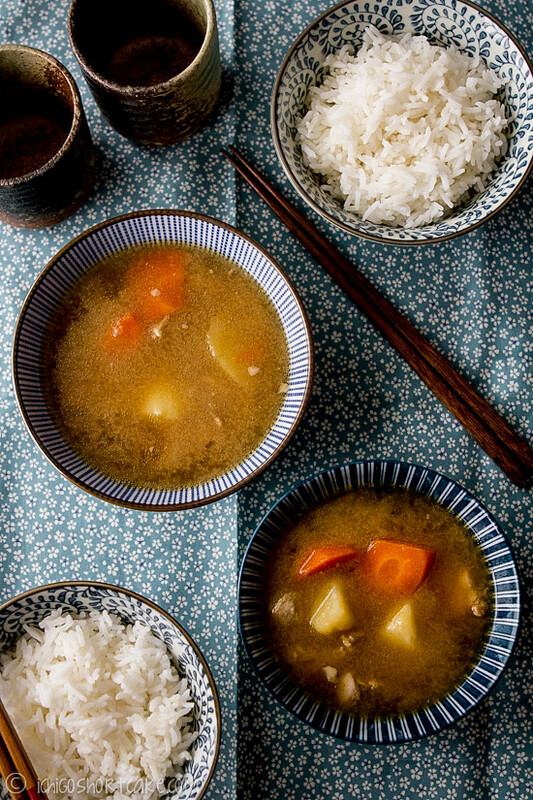 Have not tried miso-based pork soup but this is such a keeper! The soup I most often cooked at home is chicken daikon soup. If you ask me which one is my favorite miso soup, it’s been Tonjiru all this time. In fact when I make it, this becomes my main (but I have to cook other dishes for my family), and I put it in a big ramen bowl. LOL. I actually can drink two bowls of tonjiru… ahhh I miss it. Last time I ate was in winter or maybe spring. Time to cook it again. Your tonjiru looks so good Jenny!!! This turned out wonderful. Very delicious, very flavorful broth. Thank you!